The Vinyl Racing Stripe Store - In Business for over 22 Years. 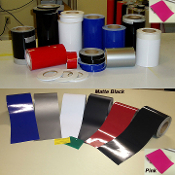 All of our kits are cut from our high quality "3m Vinyl". 3m graphics vinyl can be applied using a wet application method which allows even the most inexperienced person to successfully install stripes using soapy water and a squeegee. To apply our stripes just mix a 16 ounce bottle of water with 1/4 teaspoon of Dawn or Joy soap. Peel the backing off the stripe you are working with and then spray the adhesive side of the stripe and the car with the soapy water solution. Lay the stripe on the car and slide it into place. Then spray the top of the stripe and squeegee into place. The soapy water will minimize scratching from the squeegee. You can also wrap the squeegee in a soft cloth to eliminate scratches. For more detailed instructions and videos click here. To see our car gallery click here. We carry several widths of striping to accomodate large or small vehicles. We carry a 6", 8", 10" and 12" width in both 30' and 36' lengths. 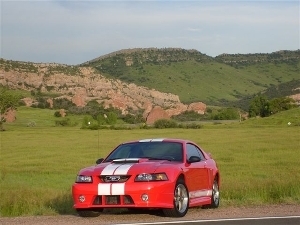 A 30 foot kit will create a dual stripe on the hood, roof and rear deck of almost all cars. 36 foot kits are for going down the bumpers with a dual stripe as well. We also carry full 150 foot rolls of vinyl striping in 1" up to 12" widths. Our vinyl striping is glossy (except for Matte Black) and has a 6-7 year outdoor rating. Silver has a mild metallic look and has a lower outdoor life if over exposed to direct sun. This is due to the metal in all metallic silver films. CLICK HERE TO WATCH A STRIPE INSTALLATION VIDEO. CLICK HERE TO WATCH ANOTHER STRIPE INSTALLATION VIDEO. We invite you to browse through our store and shop with confidence. We invite you to create an account with us if you like, or shop as a guest. You do not need an account to order from the site. Either way, your shopping cart will be active until you leave the store. Available in 30 or 36 foot kits. With or Without Pinstripes. Available in many popular colors. No experience is necessary to install these stripes. 8 inch wide racing stripes for all cars. 10 inch racing stripes kits that fit all cars. Full 150 foot rolls of 3m vinyl striping. Our 3m 6" STRIPE KIT includes a full 30 or 36 feet of 6" striping. This is enough to cover the hood, roof and rear of the car. Available WITH or WITHOUT a separate roll pinstripes.